We've talked a lot about the massive opportunity for the services industry as we move into times of unprecedented complexity. However, while complexity brings us much opportunity to solve problems and design new solutions, it also brings skills challenges that could prove insurmountable for many, without external support. 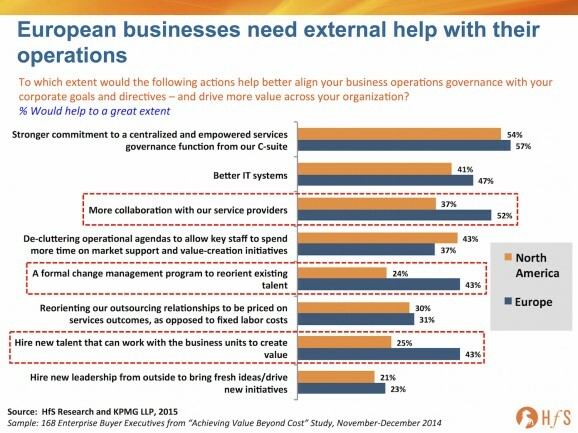 Settling for the status quo is clearly not a viable option for 43% of European firms viewing a formal change management effort, or simply bringing in new talent, as essential actions to get themselves out of their current predicaments to get better value from their operations. 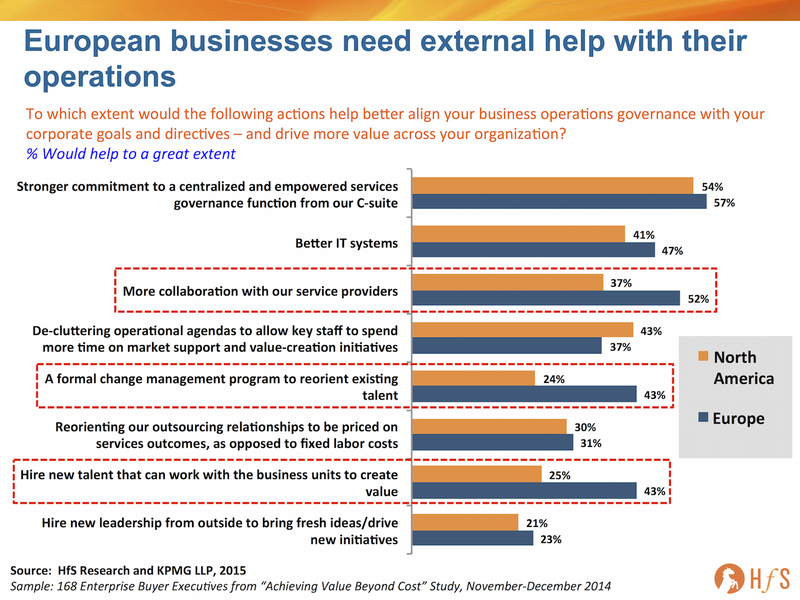 While the need for better IT systems from all global enterprises comes as no surprise, the open admission, from more than half of European enterprise operations executives that they would benefit greatly from better collaboration with their service providers (compared to a third of their North American counterparts), brings us to the conclusion that the majority of large-scale European firms are in dire need of third party help to achieve better value from their existing operations. What's more, the real number of European firms in need of external help is probably much greater than this, and the fact that half are already acknowledging this is worrying. Clearly, rigid labor laws and the "job for life" mentality is still besetting many European enterprises, which this survey data substantiates. There clearly is a need for more flexible labor in many European countries, and the ability to source skills "As-a-Service" from providers is becoming increasingly attractive to those firms tired of being held hostage by stagnant workforces unwilling to change with the times. Simply put, driving change into your talent base is hard, and surely driving many firms, eager to roll with the times, to examine more flexible As-a-Service models to be more effective. The talent crunch is prevalent right across our global industry, with services providers freely admitting that staying ahead of the talent curve is their number one challenge, as the demand for addressing ever-complexifying corporate needs is already reaching unprecedented proportions. We need skills to help us understand our financial data to make better investment decisions in emerging markets, to redesign process flows that get our products to the right markets quicker, to align revenue opportunities with our global supply chain activities, to understand where to make talent investments based on high-growth market needs. We need to understand the viability of maintaining legacy products at the opportunity cost of investing in emerging product areas and other innovations. This means we need operations that contain the technology and process standards that can extract this data... with the right people that have been trained how to use it effectively - and can develop their skills on a continual basis. We need skills and infrastructure that can support our business in an As-a-Service fashion... in an As-a-Service Economy. My fear is where enterprises fail to develop their capabilities, they will simply settle for "good enough" and take as much cost out of them as they can. It's like when most enterprises cut their HR departments down to the bone in the 90's and 2000's as they simply were not getting value out of them - they'd become transactional functions which kept things functioning, as opposed to really performing for the business. The same is already happening in other operational functions, such as IT, finance and procurement, claims processing and data management etc., where many enterprises are simply not getting enough value. If the skills fail, but the technology is adequate, we'll see entire functions being replaced by digital portals, automation tools and functional platforms that can get the job done in a low-cost, standard fashion. Enter any major enterprise today, and I guarantee you their HR function is likely to be a portal with links and a 1-800 number to call on the offchance you can't get services executed for you automatically. What's preventing firms doing this for other operational functions, where automation becomes a more effective option for them? However, I do not see this digitization of human services happening as ruthlessly as what's transpired in HR - we've been through many inflection points in history, where the skills requirements evolve with changing needs and demands and today's era of new digital capability is no exception. Yes, the advent of the cloud, mobility and social media have changed the way we will forever do business, but we are already adapting to these new environments and starting to address what needs to be done to plug the gaps. Facebook, LinkedIn and Twitter are all decade-old developments and have changed little in recent years, with little further dramatic disruption on the horizon with regards to social media and communication. Mobility apps and capabilities are all mainstream today and the cloud infrastructure capabilities of all the major ITOs and SaaS providers are pretty robust, scalable and proven. We've emerged well from these disruptions to operate in much more global, virtual, adaptive playing fields. Good article, Phil. The workforce challenges have been a problem for decades for most firms outside of the UK. I do not see these challenges as anything new here - all business are facing similar challenges in terms of getting value from their back office, and it's worse when labour laws make it so challenging to make changes. It's the reason why most European firms have not done nearly as much outsourcing as US firms, because of the works councils and excessive costs of redundancy. Instead, most simply slow down hiring for essential roles only and look at third party services for adding capabilities, instead of replacing them. However it is interesting how so many are looking at formal change management as a solution - I assume from this most firms know they are stuck with what they have and need to make concerted efforts to improve it. Great insights. Can you explain more about why as-a-service is different from traditional outsourcing? Why is this going to be a different opportunity when the labour laws are so challenging? @John @Steve: This is different from traditional outsourcing, as "As-a-Service" is more about accessing plug-and-play solutions (with higher value services weaved in) than a messy, complex shifting of labor with heavy upfront implementation and transition costs. As-a-Service is about writing off legacy technology investments, business processes and practices of the past and moving into new ways of doing things that are simpler to access, paid for by subscription (and/or outcome). I have a different opinion Phil. I wonder if As-a-Service Economy will make significant changes to European dilemma or just another term!!. Even today, Europe is facing challenges like language barriers at operational level people, documentations in local languages, cultural differences and many more. As you rightly said, 'Tomorrow’s successful enterprise is as much about getting its labor strategy right' and I am not sure how this will happen in Europe which is highly diversified in culture and language. 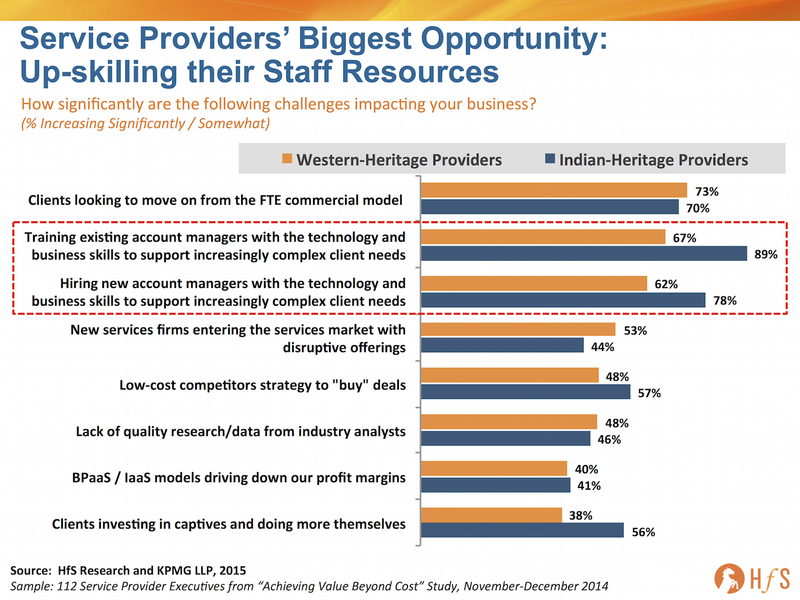 @swapnil - agree the mish-mash of languages and business differences/cultures is a huge issue. However, the more you can standardize processes, the easier it will get to overcome these barriers. SAP has done a brilliant job using its consulting group at the local level to help regions roll onto the software. Their issue is finding good local partners to work with their international clients at rates that are not insanely expensive to perform tasks, such as compliance for Nota Fiscale (Brazil), the Russia Tax Code, or China's Golden Tax. What SAP does well is provide a lot of documentation and self-help to its clients during international roll-outs. As-a-Service offerings across Europe need to have fungible consultative support that is inexpensive and easy to access (i.e. using virtual support consultants on work-at-home or crowdsourced models) and first class self-help tools (just look at Legal Zoom as an example here, where you can practically set up and run a business without a lawyer these days). Europe: If you can&#8217;t do Arbitrage, then Automate!